Nijmegen, Netherlands, October 8, 2003. An unusual occasion in the world of open-source software: A prize for the best contribution to a project. Many software developers work on freely distributable computer programs without compensation. Thus it does not provide them with money and the work must be done next to a job or studies. An expression of appreciation for the work done is appropriate. Mostly this appreciation only consists of an informal "thank you" from users. For the A-A-P project we wanted to do more than that and the contest for the Zimbu Awards was put in place. Zimbu is the A-A-P mascot. Adriaan de Groot receives the 444 euro award for "the best contribution to the A-A-P project". He has tracked down a large number of problems and provided solutions. He changed the documentation from SGML to XML and wrote an explanation about how to get the required tools for XML. Adriaan added support for "libtool", helped implementing language modules and improved the robustness of several commands. 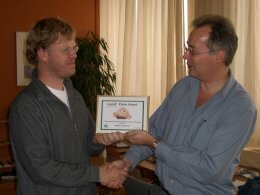 Rui Lopes receives the 222 euro award for "the most useful patch for Aap or Agide". Rui made the FreeBSD port of Aap and supplied patches to make installing Aap work a lot better. The quality of his patches was remarkably high. By making the FreeBSD port he also increased the visibility of the A-A-P project. Jörg Beyer receives the 111 euro award for "the brightest idea for the A-A-P project". Jörg has supplied several solutions for tricky problems in the Aap implementation. The scope support was based on his ideas, he made a first implementation for the automatic configuration support and improved the setup for testing. Strangely, not much of his code ended up in Aap, but his suggestions were indispensible. Jörg donates his prize to the ICCF Holland Foundation, to help needy children in Uganda. Adriaan de Groot, the winner of the main prize, was pleasantly surprised with the award being presented to him in person. It happens to be that the winner works not far from where the A-A-P project leader lives. Everybody in the world had an equal oppurtunity to get the prize. Adriaan has clearly given the largest contribution to the project. Bram Moolenaar, the A-A-P project leader, assures that the distance was of no importance when selecting the winner. More pictures of the award presentation. When asked whether the chance to win a Zimbu Award has motivated him to work on A-A-P Adriaan replies this was indeed so. He has a limited amount of time available and a lot of plans. Nevertheless, his appreciation for the capabilities of Aap also played an important role. He expects that Aap will make building KDE applications a lot simpler. Adriaan intends to keep working on this the coming months, thus he certainly deserves the Zimbu Award. Obviously, the development of Aap and Agide continues. Despite the passing of the deadline for the Zimbu Awards the A-A-P maillist is busy with discussions about further improvements. We are thankful that many developers are willing to spend time on improving open-source software without getting a prize. The prizes have been made available by Stichting NLnet, the organisation that also funded the setup of the A-A-P project. The name of the project. It is not an abbreviation, it was selected because the "a-a-p.org" domain was available and sorts nicely. Name of the major program in the A-A-P project. Aap executes recipes, which are files that describe work to be done. It can be compared to "make", but is more robust, portable and has many more features. Another program of the A-A-P project. It stands for "A-A-P GUI IDE". It is a flexible software development platform. The A-A-P mascot. Aap is the Dutch word for monkey.